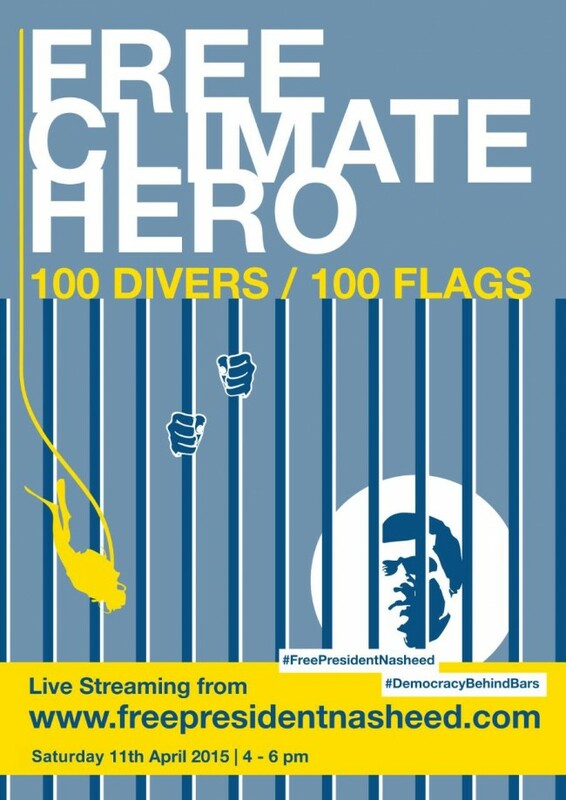 Scuba dive event to recognise President Nasheed’s climate advocacy work with 100 divers carrying 100 flags calling to #FreeClimateHero President Mohamed Nasheed will be held on 11 April 2015, 4-6 pm, Male’ Maldives. President Nasheed always maintained that democracy is the best climate adaptation measure for the Maldives and small island states. Restoring democracy in Maldives is crucial for us to play an important role in the fight against climate change. President Nasheed contributed immensely to the climate change debate. He is a climate hero and a global climate leader. His voice is important for island states, especially ahead of the UNFCCC climate talks in Paris this year. He is not only a democracy hero, but a climate champion. He made the bold decision to ban shark fishing and Maldives decision to become a carbon neutral country by 2020 are noteworthy. Maldives first UNESCO biosphere reserve was also established during his presidency.